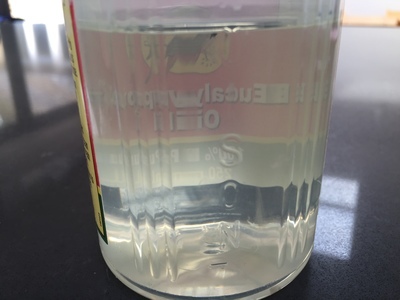 It's a clear oil but be careful to keep out of reach or children and do not consume. Rub a little on the label, wait a moment and then wipe off. Click here for more detailed instructions and pictures. Add a couple of capfuls to fresh and disinfect toilets. 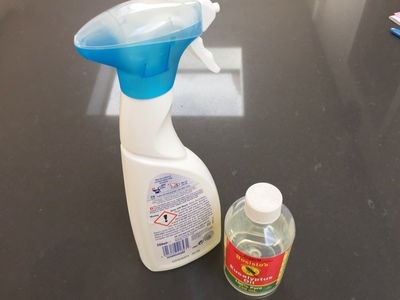 Use an old clean spray bottle and fill with water and a capful of eucalyptus oil then use to spray and wipe worktops in your kitchen. 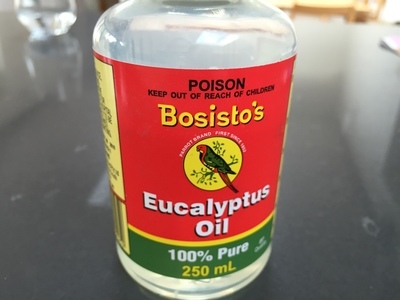 Fill a bucket with water, add a couple of capfuls of eucalyptus oil and use to mop your kitchen and bathroom floors. Get rid of grease spots or stains by dabbing gently with a cloth soaked in eucalyptus oil. Try first on an area that won't be seen to make sure there is no adverse affect to the material.